Victoria, Mahe (Seychelles) – May 14, 2018 (travelindex.com) – Africa’s INDABA 2018 has come and goneIndaba, the well-known tourism trade fair of Africa, has come and gone, and the chance for Africa to showcase itself to the world has passed. Minister Derek Hanekom said, when he opened this latest Indaba, that 1747 Buyers coming from countries all over the world were present to meet and discuss with the 22 exhibiting African countries, half of the States of Africa working to increase the tourism movement to the continent. Today, Africa pulls just about 5% of the total tourism movement. Showcasing the key USPs of the continent and rewriting the narrative of Brand Africa is the responsibility of each Tourism Board and Tourism Minister of the continent. Visibility for the continent and its islands will not, and cannot, happen by itself; Africa will need to do it by itself and for itself. The new Minister for Tourism, Civil Aviation, Ports and Marine, Didier Dogley, moved into his new office at Botanical House on Friday May 4, 2018. Formerly the minister of Environment, Energy and Climate Change, he was assigned the new portfolio in a Cabinet reshuffle announced by President Danny Faure on April 26. Minister Dogley has welcomed his appointment as the new minister responsible for tourism, adding that it provides him with an excellent opportunity to shift his efforts, from taking care of the bedrock of Seychelles tourism — the natural environment — to ensuring that discerning visitors get to discover and experience the true qualities of the Seychelles islands as a world class destination. “In a world where unspoiled natural landscapes and seascapes are becoming a rare asset, Seychelles still offers a wide array of unique sites with breathtaking beauty and exceptional experiences,” he said. 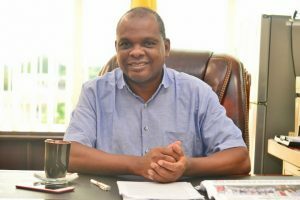 “My vision is to use my knowledge and experience in environment stewardship, coupled with a strong partnership with the trade, to ensure that Seychelles becomes a model for sustainable tourism to the world, enriched by the creole culture and the hospitality of our people,” the minister added. Didier Dogley was first appointed Minister in February 2015, and assigned the Environment, Energy and Climate Change portfolio. He had previously held high level positions in that same ministry including the post of Director General, Principal Secretary and Special Advisor. An important judgment of the Court of Justice of the European Union on the compensation of passengers in the case of flight delay brings relief to passengers. The judgment delivered by the Court of Justice of the European Union (“The Court”) on 7 March 2018 handled numerous complex cases (Cases C-274/16, c-447/16 and C-448/16) dealing with the same subject: the compensation of passengers for the delay of a flight and the competent jurisdiction in the case of a dispute which appears between the passenger and the airline responsible for the delay. Passengers are often too vulnerable when faced by long flight delays, especially when the airline management shows a total lack of interest and fails in their responsibility and duty of care. In conclusion, the Court of Justice of the European Union once again clarifies its case law in the area of “air” disputes. In the light of the Brussels 1 Regulation and this new case-law, the rules established are favorable to passengers and may be unfavorable to airlines. These companies will have to be attentive when they deal with so-called “correspondence” flights. If the companies make a mistake, they might have to defend themselves before a Court in another Member State and that would make their defence more complicated. A problem in a village or region of an African State becomes an Africa-wide problem. The last Ebola epidemic affected the economies of many countries of the African Continent because the press did not take the trouble to say that the epidemic was in that village of that particular country alone, and not in each of Africa’s fifty-four independent countries. Today, WHO is planning for ‘worst case scenario’ over DRC Ebola outbreak. At least 32 ‘suspected, probable and confirmed’ Ebola cases have been registered in the DRC since April, WHO says. The world has a duty to speak of this latest challenge, but the world must also speak of the northwestern town of Bikoro and the surrounding areas in the DRC and not refer to it as Ebola epidemic in Africa, because it causes confusion in the world of tourism and distant countries from the affected areas also suffer from such adverse misinformation. It has been confirmed that the Constitutional Appointments Authority (CAA) of Seychelles has initiated proceedings against the sitting Chief Justice, Mathilda Twomey. Judges from foreign lands have been recruited, and are being flown in and duly housed, to hear the complaints levelled against her. The target on the Chief Justice’s back appears to follow the suspension of Justice Karunakaran from office. The CAA currently has a number of political appointees on its board and this may well set the trend where Judges will change depending on political affiliation, consequently undermining the independence of the three branches of Government, and the doctrine of separation of powers. From the Maldives we hear:- “Maldives Chief Justice Arrested As President Abdulla Yameen Declares State Of Emergency. The move gives sweeping powers to security forces to arrest and detain suspects, and comes amid a deepening political crisis in Maldives as President Abdulla Yameen defies the Supreme Court”. In the Philippines the world press reports:- “The Philippines’ highest court on Friday forced out its chief justice, removing a fierce critic of President Rodrigo Duterte and his brutal war against drugs, which has left thousands dead”. The first woman Chief Justice in Africa was in Lesotho and now the world press are reporting as follows:- “We have received a statement by the Chair of the Southern African Chief Justices Forum – the Hon. Chief Justice Shivute, on plans to remove the Hon. Chief Justice Majara of Lesotho, from office. The SACJF has called on the authorities of the Kingdom of Lesotho to uphold the rule of law and handle the matter in accordance with the principles of natural justice and due process”. Seychelles appears to be mirroring this concerning trend, prompting a pervasive loss of confidence in Government as a whole. The treatment of the Chief Justice by the State serves as a grim reminder that the Judiciary can be pulled back into line whenever they try to exert their independence from the Executive and the Legislative. Let us learn from the mistakes of the Maldives, the Philippines and Lesotho and allow the Judiciary to manage its branch of Government free from political influences, before Seychelles too is shamed in the international press. Many are wondering whether the news that Air Mauritius will commence flights to Seychelles is true. No official notice has been issued as yet, but Air Mauritius has the right to initiate flights to Seychelles when they so wish because of ‘reciprocal agreements’ Seychelles has with Mauritius. With the new announcement that Air Seychelles shall be using only the smaller aircraft on the Mauritius run, the market for more cargo space has opened up. This run has always been a financially profitable one and the interest by Air Mauritius to re-enter the route remains a possibility.